These Diaper Cake Ideas & pictures are a sight to behold! If you are looking for some Teddy Bear Diaper Cake Ideas, check out this AMAZINGLY beautiful teddy bear diaper cake. It was submitted by Joey & Kirei from the Phillipines, and I just have to say that it is one of the most gorgeous diaper cakes I have ever seen! The colors go so well together, I love the spread with balloons & favors and it is a square cake - very unique! Joey and Kirei have "paid it forward" by sharing their cute diaper cake for the rest of us to enjoy. Their Teddy Bear diaper cake ideas continue to make this website a better and more creative resource for the rest of us - a community where everyone can come and get cute ideas to use in their diaper cakes. SO thank you Joey and Kirei for sharing!! 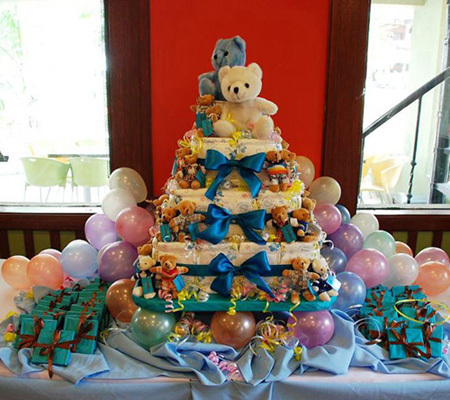 Diaper cakes in the Philippines are not yet that popular. So we thought of using this not for a baby shower but for the baptism party when our sons (2 of them) were baptised recently. We hope you like our own rendering of a Diaper Cake! Joey and Kirei, your Teddy Bear Diaper Cake is truly a work of art! Thank you for sharing it with us! !